I read this article and found it very interesting, thought it might be something for you. 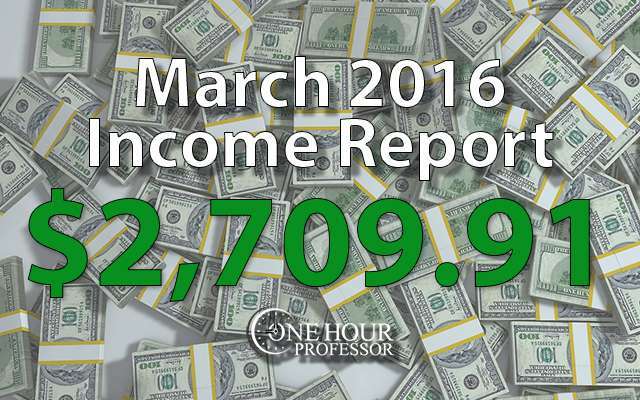 The article is called March 2016 – Monthly Income Report and is located at http://www.onehourprofessor.com/march-2016-monthly-income-report/. As predicted, another awesome month in the books! I mentioned last month how my authority website, JobsForFelonsHub.com (“JFFHub” moving forward) ended up going viral and how I thought earnings were going to be pretty consistent month-to-month moving forward. Lucky for me, the ideal situation came true. This month, I’m happy to report very high earnings again and anticipate that these will continue to climb as time goes on. So far, my authority website has made me $5,814.64 in revenue and though I’m not promising that you can replicate these exact results, I did create a FREE mini course that’ll help you understand the basics of creating a website like this for yourself. This month, my time has mostly been focused on three different projects that I’m working on. I know I usually tell people to only focus on one thing at a time, but I get bored when I do that so I usually like to have two projects at a time. But this third project is pretty small and is the result of a Facebook conversation I had with someone. More details about that conversation below. How to Become an Online Entrepreneur: This post includes a 20 step guide to becoming an online entrepreneur. I was pleasantly surprised to see that this has been shared multiple times on Linkedin and a lot of people really seem to like it. If you haven’t seen this yet, I recommend that you read it because it’ll give you an idea of what steps you have to take to go from a full-time employee to an online entrepreneur (from someone who’s actually done it). A Day In The life of an Internet Entrepreneur – Perception vs, Reality: One of the things that bothers me about the online entrepreneur space is that people tend to only focus on the positives and rarely talk about the negatives. In most cases, you’re going to be told about an individual who works from their laptop on the beach and spends 10 hours a week checking on the thousands of dollars that they’re making, but the reality is being an online entrepreneur is much more difficult than that. Logos For Cheap – How and Where I Get Cheap Logos Online: I get asked fairly often how and where I find logos for my websites. I can tell you confidently that I never spend more than $25 to get a logo designed and my method is very easily replicable. Authority Website – JobsForFelonsHub.com: Aside from spending time blogging on OHP, as usual I spent some time on JFFHub and most of the time was going over blog posts that had been written as well as replying to emails. Beyond that though. One thing that I’ve been focused on is developing partnerships. The way I see it, JFFHub will probably make around $2000 per month if I continue down the same path that I’ve been on, but it makes a lot more sense to partner with companies that will pay me per lead and possibly even advertise to double or even triple my income. A company that delivers leads to lawyers: This company has already agreed to partner with me and now when I present them with a lead for different areas of the law, I’ll get somewhere in the range of $15-$30 per lead. A company that provides inmates with calling cards: Truth be told, I never even thought that this was a big deal but apparently it is. I knew that inmates needed to be able to talk to their loved ones on the phone, but I didn’t know that prison systems usually charge $.07 per minute. The company that I found allows them to buy calling cards for as low as $.01 per minute. If I’m able to get my audience aware of these cards and purchase them, I make $15 per lead. A company that focuses strictly on expungements and sealing records: The main issue that the visitors to JFFHub have is that they can’t get employed because of a felony on the record. This made me wonder, is there a company out there that focuses strictly on getting rid of these records? The answer is yes and although we’re in preliminary talks, I think there could be a potential partnership looming. Not sure exactly what impact this would have on my income, but I’m confident that it would be very positive. NEW Authority Website: You can see that this month I also had a ton of time spent on my new authority website and most of that is because I’m outsourcing a lot of content (so far, over 300,000 words) to make sure that I launch with a really good informational resource. My writers aren’t done yet, but they continue to create awesome content for my new authority website and when it finally launches, I’m confident that I’ll be seeing some type of traffic (and hopefully revenue) without doing any back linking it all. NEW Experimental Website Project: In addition to my current authority website, I read about something in a Facebook group that I just had to try. The entire premise is that you create a website and instead of focusing on being ranked for text-based content of the website, you focus on getting ranked for the images of the website. I’m not sure if you know this or not, but getting ranked in Google for images is much easier than trying to get ranked for the text based search engine results. The idea here is that I get ranked for the images, people click through to my website from images to see more images, then they click on a Google AdSense ad. The estimated CPC for this particular niche is $12.32, so in theory that should mean that I’ll make around four dollars per click. The key with this website project is sourcing the images which I’m working on. Also, it shouldn’t take me more than 10 hours to build and once it’s done, it should be a very passive income source. The individual in the Facebook group who told me about this was making $10 per day and while that may not seem like much, it’s about $3,600 per year doing nothing at all. I’ll let you know how it goes, but in theory it sounded a pretty good idea so long as I can get ranked. NEW Email Marketing Course: The good folks over at Udemy reached out to me and told me that they wanted to create a course with me. After much deliberation and a lot of back and forth about what the topic should be, I decided to create an email marketing course. This email marketing course isn’t focused on helping you understand how to use an email marketing platform, but instead it’s focused on explaining how important email marketing is to websites/brands and different tactics you can use to further engage your audience and be more successful with email marketing. I’ll be spending a lot of time in April working on this, but I’ve already done a significant amount of work and have my video editor spending hours each day creating the videos. Social Media: In addition to everything else, I also did a podcast recording with Justin from Empire Flippers and although the podcast hasn’t been published yet, I’m very excited to hear it when it does come out. I’m counting this in the social media area because I usually make my connections that way and I’ve been doing a lot more networking in social media groups. What I’m trying to do is get featured on one podcast or blog each week moving forward. Though that isn’t a lot, collectively it becomes a lot of appearances on many different platforms and I can start to gather followers from their audiences. A long time ago I tried this, but I was trying to contact too many people at once and got overwhelmed. I’m finding that this approach of getting one feature per week is a much better way of actually following through on getting more PR for my brand. Another awesome month in the income department, but I definitely want to continue to grow this as quickly as possible. Not surprisingly, a lot of my income came from my authority website, but I’m starting to see consistent income developing in other avenues as well. Kindle Ebook Sales: I have to admit that I felt a little dumb about this one. You see, when I first started my authority website I also published a book titled “Jobs For Felons” and put it on Amazon. Never once did I check my earnings, but then the other day I went in there out of curiosity and realize that I probably made some money. Turns out, my account has about $26 and it that I had no idea was sitting there. Legal Match: This is a service that I talk about on the OHP website as well as JFFHub. They connect people with lawyers and it’s a few bucks for doing nothing each month. Long Tail Pro: I was pleasantly surprised to see that I made another sale of the Long Tail Pro keyword research tool. I still swear by this one and promise you that it’s the best product to do keyword research for your website(s). Here’s a blog post I made about how I use it. Shutterstock: Every month I see a few bucks come in from my affiliate partnership with Shutterstock and I’m not surprised. This truly is a great place to get website images for cheap, and if you need them I highly suggest you use it. JobsForFelonsHub.com Contributions: Each month I end up getting contributions for JFFHub sent directly to me. These happen because I tell employers that I’ll list their job for free on our job board, and then I ask them for a contribution once they’re done filling out the job posting form. A lot of them don’t send any contribution at all, but some of them do and I’m greatly appreciative of that. OHP Course Sales: You may not have noticed, but now I have all of my courses that I’ve ever created directly on the OHP main navigation. I did this because I realize that a lot of people don’t even know that I have multiple courses and I wanted to make sure that I made them available if they’re interested. Although many people say that the best way to sell courses is to do so at a really high price point, I’ve decided to keep my courses very affordable because the goal of my website has always been to help people and income has been secondary. YouTube Channel: My YouTube channel made a pretty good amount this month and it’s a completely passive channel of income. At this point I do absolutely nothing and it makes me money every month, not a bad thing to find $60 with very little effort. Thrive Themes: I made a good chunk of change from Thrive Themes again this month and I think I’m happier that someone actually purchased it than the money I get. This platform is my most favorite tool I’ve found and is incredibly valuable to me. Here’s an in-depth tutorial I wrote about it. Udemy Course Sales: My Udemy course sales this month were right on par with what they were last month. I’m hoping that I can expect $300+ per month from this income stream, but I think that I can grow it as I create more courses. If you’re wondering, yes, this is exactly why making an email marketing course. Consulting: Just my typical small consulting gigs again this month with clients that I’ve had for some time. At this point, I can stop focusing so much on consulting and focus more on my own projects because I’m making decent revenue each month. I’ll still hold on to my current consulting clients, but new inquiries I’ll be selective about. Feel free to contact me if you need help, my minimum hourly rate is $100. Google Adsense: Hopefully this amount of money is consistent, but it’s looking like Google Adsense will continue to be my biggest money maker month after month. Almost all of this comes from JFFHub, but I do have a few ads on OHP and one other small website that makes $10/month in Adsense. Aweber: As always, I got a few bucks from Aweber this month as well. I cut my expenses a little more this month and I have to admit that even I was surprised by this when I put together the final numbers. I’ve done a ton of outsourcing this month, but a lot of that is cheaper hourly than what I’ve previously done. Aweber: A quick cautionary tale for those that use Aweber. I was recently looking at my bill and wondering how it had gotten all the way to $70 per month. Though this isn’t a ton of money, this is pretty high considering I didn’t have that many active subscribers. Upon further investigation, I found out that Aweber charges you for the people that you have unsubscribed from your email list. In their terms, those emails are still costing you money because they are still records in their system. This is a little annoying, but the way to fix it is delete those emails from the system and then you will no longer be charged. I’ve done this and expect that my April email marketing cost will be less than what it was in March. Hootsuite: $10 per month to automate all of my twitter messages and post to all of my social media platforms in bulk. Yes please. I will say that I’m considering a more robust social media platform soon because I’m starting to get more into Facebook groups, but I’m just not there yet. By the way, if you haven’t joined the One Hour Professor Facebook group, now’s your chance. Transcriptions (New Udemy Course): I am a big fan of developing a process for any project that I’m working on. For any of my new Udemy courses, I record the content and then send it off to a transcriber. This was the cost of sending it to that transcriber. Comcast: I hate everything about Comcast, but I did want to make sure that I included the cost inside of my income reports. Siteground Hosting: This is going to be my standard hosting cost every month and although it’s much higher than what most of you pay, it’s because I’m getting a significant amount of traffic on JFFHub. If you are on Hostgator, LEAVE and join Siteground. This is by far my favorite hosting platform because they are extremely customer service centric. Facebook ads: I did a few ads last month and apparently the charges just hit my credit card. These ads were for JFFHub in an attempt to continue to grow how many people share the website. I’m happy to report that the website has been shared on Facebook over 51,000 times. Upwork.com: As usual, a lot of the money I spend each month is on freelance writers and developers. These are the costs that I’m okay with incurring because they have a lot of staying power. Meaning, the content that these people write today will be here for years to come. Did I Meet my Goals for March? I wasn’t able to get 70% of the way done with the website because there is still quite a bit that I need to do. A lot of this is falling on my writers and although they do a good job, they aren’t always great at getting things done on time. I’m okay with this though because this isn’t a dire project at the moment. I was able to get my course completely mapped out, but producing 50% was impossible because getting it mapped out took longer than I thought it would. With that being said, everything is set up now and it’s just a matter of recording lectures and handing them off to my transcribers and video editors. As I stated earlier, this one was a surprise to me. I thought that I spent more this month than last month for sure, but it turns out I didn’t spend that much. I think it just felt that way because I did a ton of outsourcing, but the cost for the outsourcing on an hourly basis was very low. I’m going to repeat this goal because I think that it’s much more achievable this month. I’m going to have to get my programmer do some interesting things for the website and I still have some content I need written, but I think by the end of the month I’ll be able to get it all done. I think that this new email marketing course that I’m creating is very valuable and want to make sure that I get it out to everyone as soon as possible. There’s still a lot of work and this depends on my video editor, but I’m hoping to get email marketing course 100% created by the end of the month and launching it. A big part of me making more money on my JFFHub website is that I need to secure more partnerships and integrate the offers they are giving me into the website itself. I haven’t figured out exactly how I’m going to do this yet, but I want to make sure that I include these offers in the email auto responder as well as build out a few pages on the website too. It’s going to take a little bit of time and strategic thinking to get this done, but this should make me a significant amount of money so I need to focus on it. Another awesome month, well done Ron. Having taken a quick look at Jobs for Felons Hub, it really looks and feels like a “true” authority website now. I think you have a potential goldmine on your hands and look forward to seeing it develop further. Thanks, Nick! Still have some other things in the works, but it’s definitely going well. Hopefully I can keep it moving forward! These are great results. Very inspiring. I’ve just got to keep pushing foreword. Congratulations for another solid month. All the best wishes ahead.